Apart from “The Art of the Brick” exhibition for Lego artworks (in my blog post dated 19 November 2017) and the Lego jelly blocks (in my blog post dated 4 June 2017), there are also other Lego-related stuff in South Korea which you can try out. Let’s talk about them in this blog post. 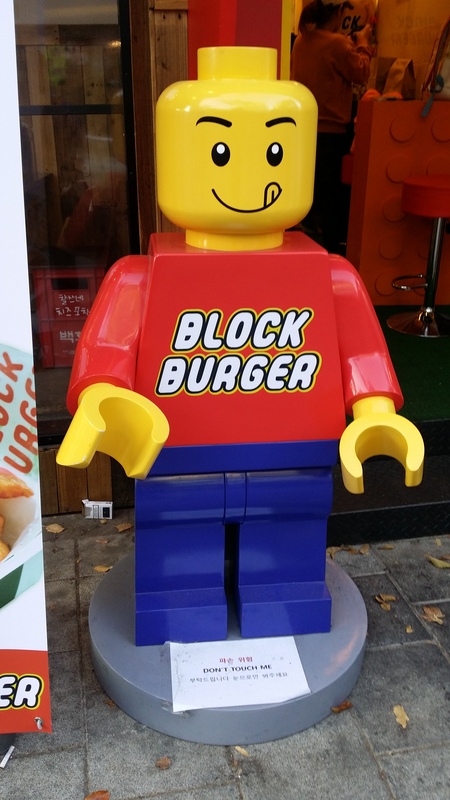 There is a small burger shop called Block Burger near Exit 9 of the Hongdae subway station in Seoul selling Lego-brick-like burgers. 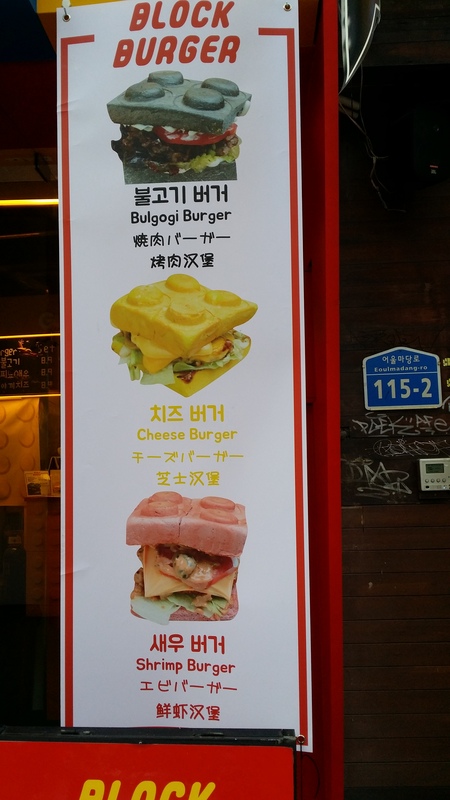 As shown in the photos above, this shop sells three types of burgers, namely, bulgogi (beef) burger (in black colour), cheese burger (in yellow colour) and shrimp burger (in pink colour). There is a big Lego figure welcoming guests at the entrance of the shop. Both at the entrance and inside the shop, the decorations are also in the form of Lego bricks. You can order a burger set which comes with french fries and coke. While enjoying nice drinks (and maybe also cake) in a cafe, usually what else do you do? Maybe reading a book or listening to music or watching a drama. In Get & Show Cafe, you can rent and play with a Lego kit while having drinks and desserts in the cafe. Also, there are many Lego merchandise and kits which you can purchase and different Lego decorations in the cafe. This cafe is near Exit 5 of Hapjeong subway station in Seoul. There is also the Brick Cafe next door but you need to purchase the Lego kits before you can assemble them in the cafe. If you really want to go on a buying spree for Lego merchandise, you can go to the Lego Store at the Hyundai Department Store Pangyo branch. This is the first store officially certified by the Lego Group. This store has a “Pick-A-Brick” zone where you can pick your favourite colours and shapes of single Lego pieces. You can have a quick tour of this Lego store by watching this video.